Montebello – O Hei There! I was driving home from a basketball game a couple of Sundays ago, contemplating what to eat for dinner that night. For some reason (most likely laziness), I decided to check the lists I made on Foursquare to see if there’s anything simple I can pick up on my way home. 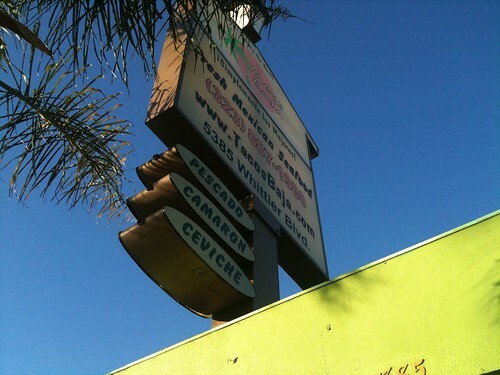 And boom – Tacos Baja Ensenada was just a mile off the 60W. 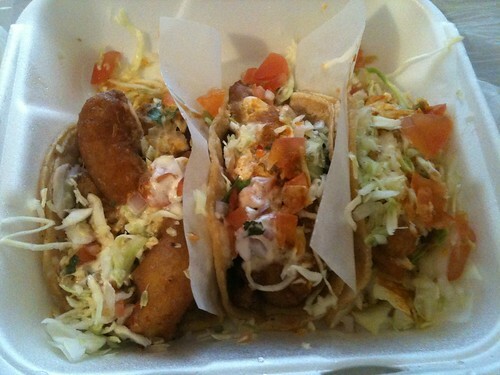 I’ve always heard that Tacos Baja Ensenada and Ricky’s Fish Tacos were the two places to go for legit fish tacos. And until that day, the best fish tacos I had were from Rubio’s in UCLA’s Ackerman Union. Sad huh? Guess it was finally time to step it up. There was a fairly long line when I got there, but it moved really quickly. I was the only one there who wasn’t Latino – a good sign in my opinion. I decided to order two fish tacos and a shrimp one. Three tacos for under $6! I decided to eat the tacos soon after I got home, because I didn’t want my judgment tarnished by soggy breading. Luckily, the fried fish and shrimp stayed fairly crispy. Both the fish and the shrimp tacos were prepared the same way, with cabbage, lime, salsa, and the ever-so-important crema. And both variations were delicious, though I obviously preferred the fish version. A lot of people tell me that Tacos Baja Ensenada has lost a step, and that Ricky’s is the king in town for fish tacos. Well, if they really did lose a step, how good must they have been before? Because these fish tacos were the best I’ve ever had. Too bad the breading was just a bit soggy and the tortilla was a little weighed down from soaking everything on the ride home. That’s my fault, really. In the end, simple and clean flavors sometimes work best, especially for street food like this. Next time I’ll eat them fresh on the spot – and work on my fading español.